Who doesn’t love an apple crumble??? It’s one of the first dishes I learnt to cook and a standard recipe to learn in Home Ec! The old-fashioned wheat and sugar one doesn’t work for me anymore, so I modified it and make this gluten-free version. It’s still tasty and delicious. The beauty of this recipe is that it’s so adaptable. Use whatever fruit needs eating up! A favourite of ours is pear and blueberry. For some reason the pears are the most unpopular fruit in the house and I am often left with a couple that are going soft. 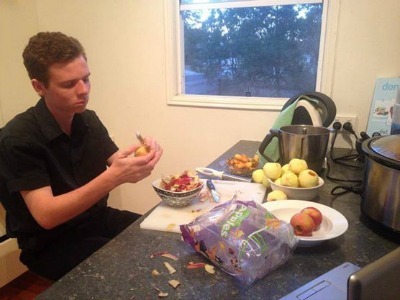 I don’t even stew the pear as it’s such a soft fruit, just slice thinly. Rhubarb and strawberry is also a great combination. You can also adapt the topping – add in whatever nuts you like! If you are dairy free, simply use coconut oil or macadamia oil instead of the butter. Use honey or rapadura or coconut sugar instead of maple syrup if you like – I just love the gorgeous caramel flavour of maple syrup in this recipe. Whack the fruit into a nice ovenproof dish. Sprinkle the cinnamon liberally over the top of the fruit. Chuck the almonds, flour, syrup, vanilla and butter into your thermomix and mix at speed 6 for about 20 seconds, scraping down until you get a nice consistency. If you don’t have a thermomix, throw it into your food processor and pulse until the mixture comes together. Get little blobs of the mix and sprinkle it on top of the fruit. Fling it in a moderate oven and cook for about 20 mins until the top is nice and brown. Serve with lots of fresh organic cream or custard. Do you love crumble? What’s your favourite? 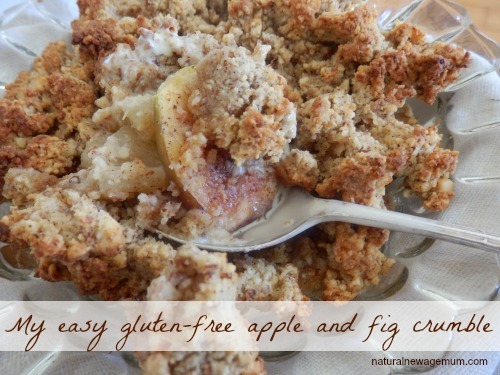 Crumble is one of my fave winter desserts for sure. I do a simple apple and date mix with walnut, macadamia and butter topping. So good! mmm yummy! so easy and healthy too!